Extraordinary Lutheran Ministry has released a major new resource for candidacy committees working with LGBTQ candidates in the Evangelical Lutheran Church in America. 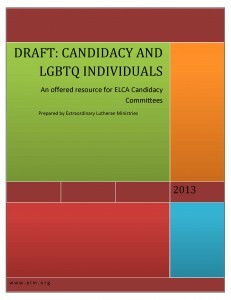 Click here to download the resource as a PDF: Candidacy for LGBTQ Individuals- Draft. The resource is also available on the elm.org homepage. Candidacy and LGBTQ Individuals was prepared as an offered resource for Synodical Candidacy Committees in the ELCA in their work with candidates seeking rostering in the ELCA. Although it was prepared carefully and reviewed extensively, the resource is being released in draft form to allow for feedback and modification from those working in candidacy. ELM will publish a final version in early October. Anyone is invited to submit comments and feedback that will strengthen this resource. Please send comments to info@elm.org. Some candidacy committees may have limited experience in engaging LGBTQ candidates. This guide is intended to help that engagement to be a respectful and rewarding one for both candidates and committees. Extraordinary Lutheran Ministries has been working with openly LGBTQ candidates for ministry for many years and has learned quite a bit in the process. This resource has developed out of that work and through extensive review and conversations with LGBTQ candidates, Candidacy Committee members, seminary staff, churchwide and synodical personnel. Extraordinary Lutheran Ministries (www.elm.org) is a social ministry organization that expands opportunities for LGBTQ rostered leaders and their ministries through three primary programs: Proclaim, the professional community for Lutheran rostered leaders and seminarians who public identify as LGBTQ; Ministry Engagement, which connects ministries led by or open to leadership by LGBTQ leaders; and Accompaniment, which supports LGBTQ people through the candidacy and call processes. The Accompaniment Advisory Team includes the following people: Rev. Dr. Randy Nelson, Rev. Dawn Roginski, Rev. Rod Seeger, Rev. Anita Hill, Rev. Tom Taylor, Rev. Joy McDonald Coltvet, Rev. Jason Bense, Rose Beeson, and Asher O’Callaghan. Candidacy and LGBTQ Individuals was authored and edited by the Rev. Dr. Randy Nelson, based on a previous version written by the Rev. Megan Rohrer. Reviewers and contributors included members of the LGBTQ community; rostered leaders; seminarians; former and current candidacy committee members; seminary faculty; and ELCA synodical bishops. Additional information about Extraordinary Lutheran Ministries is available at www.elm.org. This entry was posted on Tuesday, August 27th, 2013 at 2:25 pm	and is filed under Blog. You can follow any responses to this entry through the RSS 2.0 feed. Both comments and pings are currently closed.